Sri Baduga Maharaja or Sang Ratu Jaya Dewata or popularly known as King Siliwangi was the great king of the Sunda kingdom in West Java, reigned 1482 to 1521. He brought his kingdom greatness and prosperity. The historical record of his reign can be found in Batutulis inscription, discovered in Bogor, where he is known in his formal stylized name Sri Baduga Maharaja Ratu Haji di Pakwan Pajajaran Sri Sang Ratu Dewata. The inscription was created not during Sri Baduga's reign, but later in 1533 by Sri Baduga's son, King Surawisesa, to honor and commemorate his late father. He is also popularly known as a legendary character, King Siliwangi, in Sundanese folklores and tales. Some accounts of his life are taken from the Pantun Sunda oral tradition that describe his reign as a glorious era for the Sundanese people. Batutulis inscription in Bogor mentioned about the historical great king Sri Baduga Maharaja. The stylized name: Sri Baduga Maharaja Ratu Haji di Pakwan Pajajaran Sri Sang Ratu Dewata literally means "His Majesty Maharaja King of Pakuan Pajajaran, His Excellency King of deities". Most of literature recognize his name as Sri Baduga Maharaja while other argues that it was only the title to address the king, as Baduga corresponds to paduka, the footwear of kings. According to Hindu etiquette the king is held so high that common people should not directly address the king by his name, but through his shoes. Thus his real name is Sang Ratu Jaya Dewata. On the other hand, he is also known in his popular name as King Siliwangi. A liguistical theory suggests that Siliwangi is derived from the Sundanese words of Silih Wangi, meaning a descendant of King Wangi. 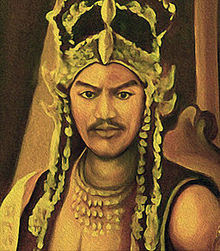 According to Kidung Sunda and Carita Parahyangan, King Wangi is identified as King Lingga Buana, a king of Sunda that died at Majapahit in 1357 AD in the Battle of Bubat. Hayam Wuruk, the Majapahit king, intended to marry Dyah Pitaloka Citraresmi, a daughter of King Lingga Buana. The Sunda royal family came to Majapahit to marry the princess to Hayam Wuruk. However, Gajah Mada, prime minister of the Majapahit Empire, saw this event as an opportunity to demand Sunda's submission to Majapahit. He demanded that the princess not be treated as the queen of Majapahit, but merely as a concubine, as a sign of Sunda's submission. Angered by Gajah Mada's insult, the Sunda royal family fought the overwhelming Majapahit forces to the death to defend their honor. After his death, King Lingga Buana was named King Wangi (king with a pleasant fragrance) because of his heroic deed to defend his kingdom's honor. His descendants with the same quality of greatness were called Silihwangi (successor of Wangi). Some other historians are of the opinion that Siliwangi is derived from the Sundanese word Asilih Wewangi, meaning changing title. According to Batutulis inscription, he is the son of Rahyang Niskala and the grandson of Rahyang Niskala Wastu Kancana. There are many legends about King Siliwangi as the great king of Sunda. Most of the legends tell the story of the rise of a young prince to seize his rightful throne and later becoming a great king of Sunda Pajajaran, bringing his people prosperity, justice and greatness. One of the stories tells about prince Ratu Jayadewata, the son of Prabu Anggalarang, king of Galuh, who ruled from Surawisesa Palace (today Karang Kamulyan site, location of Kawali inscription). During his youth the prince was known as Raden Pamanah Rasa (the archer of feelings of love). The name suggests that he was a charming and strikingly handsome young man. People easily fell in love with him. The tradition says he was a master of literature, music, dance, and the arts, as well as pencak silat martial arts and the princely arts of sword fighting and archery. An usurper of evil ambition overthrows King Anggalarang and murders him, taking over the throne. The prince Jayadewata is poisoned, drugged, and cast under a black magic spell that caused him to suffer amnesia and insanity. The powerful but insane prince wandered around and caused trouble in many villages, until Ki Gedeng Sindangkasih, the chief of Sindangkasih village, managed to pacifize him. With the love of Nyi Ambetkasih, Ki Gedeng's daughter, the prince is finally cured from his illness. Prince Jayadewata married Nyi Ambetkasih. Later, prince Jayadewata managed to gain support of the people and succeeded in reclaiming his rightful throne. King Siliwangi become the king of the unified kingdom of Sunda and Galuh. He transferred the capital city from Kawali Galuh to Pakuan Pajajaran. One of the Pantun legends tells vividly about a beautiful royal procession of queen Ambetkasih and her courtiers moving to the new capital of Pakuan Pajajaran, where her husband awaits. The Batutulis inscriptions mentioned that the King has embarked in several public projects. Among others are erecting the wall and dug the defensive moat around his capital in Pakuan (modern Bogor), built Gugunungan religious sacred mounds, built Balay or pavilions, also created Samida forest as a conservation forest. He also built a dam and create a lake called Sanghyang Talaga Rena Mahawijaya. The lake is probably functioned as hydraulic project for rice agricultural purpose, and also a recreational lake to beautify his capital city. The tradition hailed that King Siliwangi ruled justly from his palace of Punta Bima Sri Narayana Suradipati Madura at Pakuan Pajajaran and his reign is celebrated as the golden age for Sundanese people. Besides Ambetkasih, King Siliwangi had other wives, Nyai Subang Larang, Nyai Cantring Manikmayang, and Nyai Aciputih. Nyai Subang Larang was the daughter of Ki Gedeng Tapa, port master of Muara Jati (today Cirebon). Nyai Cantring Manikmayang was a princess from a noble family in Galuh. While Nyai Aciputih was the daughter of Ki Dampu Awang, a rich Muslim Chinese merchant. Nyai Subang Larang was a Muslim woman and a student of the Quro Islamic school in Karawang, and she bore him three children: prince Walangsungsang, princess Rara Santang, and prince Kian Santang. Walangsungsang, later known as Cakrabuana, was the founder of the Sultanate of Cirebon. Rara Santang married a Muslim Egyptian prince and changed her name to Syarifah Mudaim, while Kian Santang become a famous Muslim ulama in western Java. The legend of King Siliwangi's Muslim children from Subang Larang explains the change from Hinduism to Islam around the time of the fall of Sunda kingdom. Queen Ambetkasih was childless, and the heir of the throne was Prabu Surawisesa Jayaperkosa or Ratu Sang Hyang, the son of Nyai Cantring Manikmayang. A shrine dedicated to King Siliwangi in the Hindu temple Pura Parahyangan Agung Jagatkartta, Bogor, West Java. The character of King Siliwangi is semi-mythology since in Sundanese oral tradition simply identify the great king of Sunda as "King Siliwangi" regardless the era or historical periods. As the result the tale of this king spanned greatly from the mythical era of Sundanese gods to the coming of Islam in the land of Sunda and the fall of the kingdom. Traditions associated King Siliwangi with the tiger and sometimes the black and white Javan leopard. Some historians suggest that this legendary King can be identified with an actual historical figure: Sri Baduga Maharaja, as mentioned in Batutulis inscription, he is the son of Rahyang Niskala and the grandson of Rahyang Niskala Wastu Kancana. The compiled legends of King Siliwangi do not always correspond with historical facts and records, since some events are vague and do not correspond to the lifetime of the historic Sri Baduga Maharaja. For example, the fall of Pajajaran occur in later times, during the reign of later Sunda kings, the great-great grandson of Sri Baduga. Some legends seem to simply identify the series of last Sunda kings as Siliwangi. However these legends try to explain the historical events of the Sunda kingdom and its relationship with the Sultanates of Cirebon and Banten. The traditions link Siliwangi with the mythical tiger, and sometimes the black and white leopard, as his guard. According to legends after the Sultanates of Cirebon and Banten sacked the capital of Pakuan Pajajaran, the king refused to convert to Islam, yet he also refused to fight the invading Muslim forces, since the Sultan of Cirebon was his own kin. Tradition tells that after the fall of Pakuan, the last king of Sunda, accompanied by his faithful followers, retreated to Mount Salak located south of the capital to avoid further bloodshed. Then the king is ngahyang (he disappeared) to become a hyang or spirit. He turned into a mythical beast, the sacred tiger. Through the transmission Pantun Sunda oral tradition, the Sri Baduga's reign is remembered as the peaceful and prosperous golden age in Sundanese history, as the cultural identity and the source of pride for Sundanese people. The kings of Sultanate of Cirebon still trace their ancestry to Sundanese King Siliwangi, it was probably served as the source of legitimacy of their reign in West Java. The TNI Siliwangi Military Division and Siliwangi Stadium was named after King Siliwangi, the eponymous popular king of Sunda corresponded to Sri Baduga Maharaja. His name is honored as the name of West Java province museum, Sri Baduga Museum in Bandung. Balinese Hindus built a candi shrine dedicated to King Siliwangi in the Hindu temple Pura Parahyangan Agung Jagatkartta, Bogor.